In well over 45 countries, MenCare: A global fatherhood campaign promotes men’s active, equitable and non violent involvement as fathers and caregivers around the world. 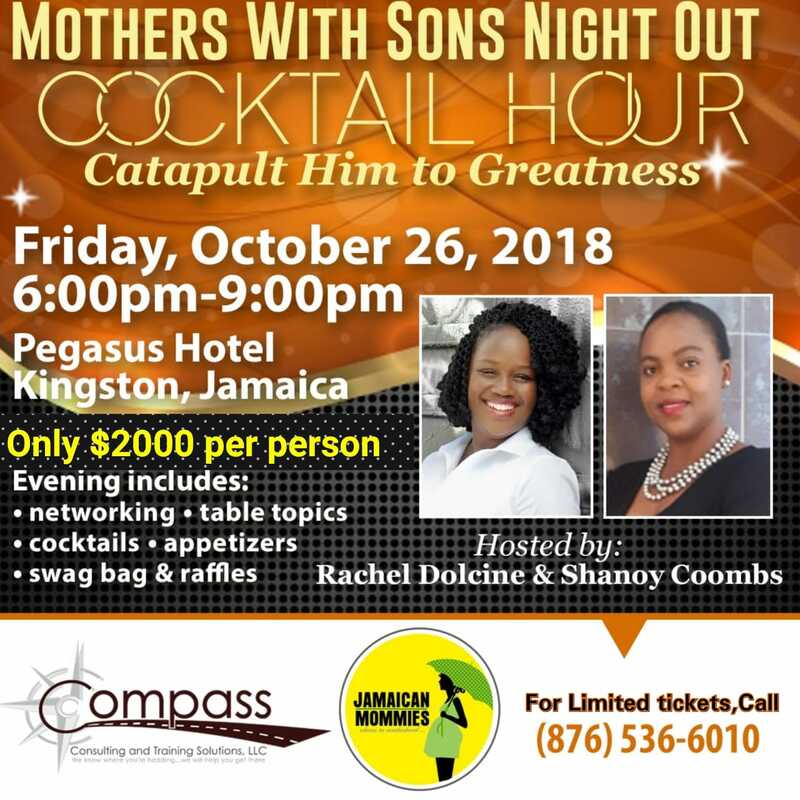 Freshly minted Jamaican based partner, ParentGoodJa/Jamaican Mommies has partnered with Compass LLC on an interesting approach by targeting Mothers with sons at an engaging and interactive session under the title “Catapult him to Greatness”. The event scheduled for October 26, 2018 at the Jamaica Pegasus hotel is part of a weekend dedicated to empowering men in the island which faces its fair share of absenteeism fathers, single mother headed households and limited events aimed at encouraging men. The other event, A Men’s empowerment symposium on October 27 is being coordinated by GEIN Transformation Enterprise and Compass Consulting and Training LLC. According to Shanoy Coombs, Founder of ParentGood Ja & Jamaican Mommies, the approach to target mother of boys was taken to shift several gender norms in relation to how women parent their sons. “Traditionally boys are taught to be tough, to play with more rugged toys, to show little or no emotion and to utilize anger and violence as outlets for disagreements. This they learn from those around them- other males and females included. With a growing percentage of female led/ single parent homes in Jamaica, it was felt to be important to engage mothers as key partners in the parenting dynamics”. “We believe that by educating mothers now about the awesome responsibility that boys have as equitable siblings, colleagues and partners, there will be some spillover benefits for men who move on to become involved and equal partners as fathers” she said. The Mothers with sons night out will feature a mix of networking, table topics, testimonials and discussions among mothers about the struggles faced as mother to a son. The mothers in attendance will also receive expert input around how to address these challenges with a view to empower and enable their sons to be more gender-equitable fathers and involved caregivers. Author of Conversations with my son:Fun and Witty Inspiration for Mothers Raising Boys, Rachel Barrett-Dolcine whose company, Compass Consulting and Training LLC is a key sponsor and who will jointly host the event with Coombs noted “I am ecstatic to be hosting this event as a part of a men’s powerhouse weekend. It is time for some real talk about how we raise our boys and the impact it has on their future decisions, relationships and success” she said. The Mothers with sons series of event has been hosted in several US states with a New York staging scheduled for December 1, 2018. As a partner for Mencare International, Coombs has indicated that several direct interventions will be rolled out over time to encourage a more actively involved role for men as equitable parents and caregivers. “There are several things in the pipeline. We already have content for a multimedia campaign, including several posters, videos, community workshops/training sessions all backed by solid research and success stories under the global mencare campaign. We are also going through a training session of sorts to be more familiar with the MenCare global guidelines and also coordinating a series of meetings with key partners to support the initiative”. She said. “Frankly, I am elated to be a part of such a life changing global campaign. I have been drawn to and grateful for same on two accounts-one as a career development communication specialist, I believe in utilizing communication for change and two, as mother to a girl, I want my daughter to exist in a world where men are empowered to be actively involved in supporting the dynamics as partners and parents”. She added. MenCare: the Global fatherhood Campaign works internationally towards two fundamental goals: Men doing 50 percent of the caregiving work around the world, and the universal uptake of equitable and nonviolent fatherhood practices. MenCare works to achieve these goals by advocating diverse policy measures in governments and workplaces; by campaigning to shift social norms and attitudes about fatherhood; and by educating men about healthy, equitable, nonviolent parenting practices. In Jamaica, Jamaican Mommies/ParentGood Ja holds the island’s first MenCare partnership accreditation and is the second country in the wider caribbean region to secure same.